To order any items listed at our BookNotes discount — 20% off, this time — feel free to use the link at the bottom of this column. It takes you to a certified secure order form page where you can just tell us what you want and enter your credit card digits and the obvious shipping addresses and so forth. Notice that we say that we’re happy to just send you a bill, too, if you’d rather pay by check, later. Or, we can ship to somebody else on your behalf. (We gift wrap for free, or can tuck a little note in saying the books are from you.) Just let us know how we can help. Thanks much. We hoped you enjoyed our previous BookNotes column, sharing a few thoughts about the vocation of being a fiction writer and naming some books not only about the significance of serious reading but sharing recommendations for good resources on writing, nurturing the imagination and such. I described plenty of titles and name-dropped a bunch of others so we hope it a post worth saving for reference or sharing with any colorful, writerly friends — or anyone who cares about words. It was, again, an illustration of our bookstore’s curated inventory in many, many areas – literature and the arts just being one of those categories – where we offer books to equip those who know that the Christian mind should be informed by what we sometimes call a Christian worldview. If you share it with anyone, do remind them, please, that they, too, can subscribe to this “news” letter. I’m often surprised that folks don’t know there is a little subscription box at the website into which you can easily put your own email address so you can get our Hearts & Minds bookstore BookNotes coming into your inbox each week. When one takes the dust jacket off of Anatomy of a Miracle, it reveals a longer subtitle, pressed on to the hardback cover itself: “The True Story of a Paralyzed Veteran, a Mississippi Convenience Store, a Vatican Investigation, and the Spectacular Perils of Grace.” No wonder Dave Eggers loves it. 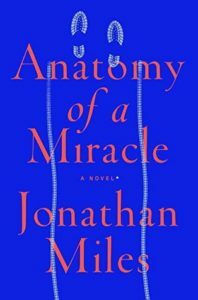 Jonathan Miles has written a novel whose comic moments alone make it a wonderful read, but Anatomy of a Miracle quickly becomes so much more: an intense, and intensely profound, meditation on how an extraordinary event might test the limits of both scientific and religious belief. What a superb writer; what a superb book. It seems I’m always in the middle of a couple of novels and a number of memoirs. I can’t wait to tell you about some well-written memoirs that I personally enjoyed. But our wheelhouse here is religious non-fiction and I want to revisit two very wonderful and very important books that I only announced briefly when they first came out, books that deserve a second run-through to tell you about. And I’ll add a third that is very new, offering a trio of remarkable books that I am sure will help you – no matter your age or stage of faith, no matter your season of life, whether things are going well or whether you are struggling. These are extraordinary books that seem to relate or pair well together and we recommend them to you. 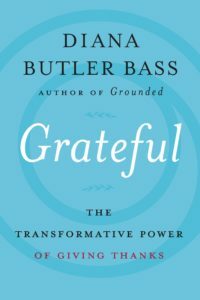 Grateful: The Transformative Power of Giving Thanks Diana Butler Bass (HarperOne) $26.99 I was enthusiastic in my description of this when the book released a month ago, and I encouraged all within ear-shot to consider it. I admitted that I wasn’t sure what I’d think about it, at first, but realized it is really good. I tried to explain it briefly, but wanted to revisit in now. Bass is a scholar of religion and an activist and travels in circles with beautiful writers like Barbara Brown Taylor and thoughtful colleagues in the biz like the late great Phyllis Tickle. I still smile thinking about a picture I saw of Diana with her little string of pearls and demure business suit standing all arm in arm with the tatted up Lutheran rock star Nadia Bolz-Weber and her low-slung jeans. Diana’s last book was about an eco-friendly, “this world” sort of spirituality that not only finds God’s presence in the beauties of creation and in the ordinary stuff of quotidian life, but equips us to serve the common good in our own places; it is called Grounded: Finding God in the World – a Spiritual Revolution (Harper; $14.95.) I mention all of this so you can place her within the broader landscape of religious writing these days. She is somebody you should know and somebody I really appreciate. I explain all this not just to gently place Diana within the spectrum of religious writers these days and so you know a bit about her, but to again revisit what I said in the earlier, brief review of Grateful. She herself apparently had some of these misgivings — the prologue of the book is called “Confession: No Thanks.” Ha. That’s my kind of starting point for a book like this. And so, I sort of justified to our sophisticated and culturally-engaged BookNotes readers, that this book was a double-dipping or triple-dipping sort of read; that is, it invites us to a personal virtue and habit of thankfulness even as it nurtures us into a deeper spirituality, even as it reminds us of the social and civic implications of taking on attitudes and practices of authentic gratitude. It’s all three at once! Now that I have finished Grateful: The Transforming Power of Giving Thanks I’d very much like to share just a few quick observations that might inspire you to order it from us. I’m unashamed in promoting books I think will be helpful, and this is one of them. It would make a great book for a study group – in your church or among your neighbors, churched or not. It is classy and interesting and nicely written. First, I pitched this in that last review, as I sort of did, again, above, as a civic minded book analyzing the idols of our culture, the dysfunctions of our body politic, some of which emerge from a stinginess that might be subverted by the practices of a reframed worldview based on gratitude. This is a fair pitch, telling you that Butler Bass wrote this a during the early days of the Trump administration and was, in a way, discovering from her own deep reflection, ways to be glad about life despite the dreadful and chaotic times around us. I didn’t want anyone to think this was cheesy or a Pollyanna move, a turn inward and inspirational and away from the heavy, critical stuff Butler Bass has called us to before. Fair enough: there’s a “common good” and cultural aspect that makes Grateful nearly subversive. She cites the astute, scholarly work of Peter Liethart Gratitude: An Intellectual History (Baylor University Press; $39.99) and was obviously informed by liberation theologian Mary Jo Leddy who has a book simply called Radical Gratitude (Orbis Books; $18.00.) She gets the public virtue stuff, and is always interested – like Walter Brueggemann, whose Scriptural work she always relies upon – on the social implications of Biblical faith. But realize this, too: I was won over reading Grateful as a book of sciency/social-sciency self-help guidance advice. Yes, she draws on the best and most recent data on brain studies and such, showing how and why keeping a gratitude journal or fostering an attitude of gratitude is good for you. (Literally it’s good for your health!) And yes, she links that to a good and generous spirituality, a deeper sort of prayer and worship. But at the end of the day, as informed as this book is by good research and her wide reading, it impacted me for its common sense advise, spoken to me in a voice I was able to hear. Maybe other “inspirational” writers have said it more simply, but I needed Bass’s wholistic and socially responsible framework to get to this good, good stuff. She is countering a narrative of negativity – which is very strong in my own life, by the way – and offering this ancient practice to offer a better way to life. It’s a simple as that – this book really explores how helpful and good and fruitful a thankful outlook can be. Secondly – and it wouldn’t ring true as practical and good if it didn’t go here: she is very honest about how this practice of being thankful is not a justification for stuffing down our feelings of sadness, not a justification for failing to lament or grief, and not a way around the hard theological questions of theodicy and the like. It is not a call to apathy or complicity in great evil. We can be people who both celebrate and weep; we can be people who are festive with gratitude and who lament and protest. In fact, this is where the book deeply touched me – I even had to wipe tears away a time or two, which I hadn’t anticipated. More than her other books – even her very interesting quite personal memoir, now out in an expanded and revised second edition, Strength for the Journey: A Pilgrimage of Faith in Community (Church Publishing; $22.95) – she tells of some of her own personal struggles. She is explicit (although not graphic) about saying she was abused as a youth. She talks about her years of having no generous thoughts whatsoever about this bad uncle, now deceased. She tells of some other hard things in her own life that any caring reader will be captivated by, and that many will surely nod in agreement with, perhaps through tears. You too, Diana? Me too, indeed. Practicing habits of thankfulness – even the much recommended “gratitude journal” – is no panacea for discontent and doesn’t offer promises of easy healing for deep hurts. But she shows from research, from stories, and from her own life, vulnerably revealed in these pages, that it can help us move in the direction towards renewed hearts and refreshed, even joyful, lives. I have to admit I don’t read many self-help books, but this was a really, really good and life-giving resource for me and I am going to revisit it throughout the summer. Another thing I liked about Grateful is how it is layered with a complex and multi-dimensional approach but is so clear and nicely arranged. There are four distinct parts to Grateful, each with just two chapters. Part One and Part Two are about what she calls “Me.” The chapters in Part Two and Three explore what she calls “We.” Me and We; easy, huh? And in each of those respective parts, she looks at what she calls the emotions of gratitude and the ethics of gratitude, first for us as individuals, and then for us together, in community and in public life. Once again; Part One is called “Me: Emotions” and Part Two is “Me: Ethics.” Part Three is “We: Emotions” and Part Four is “We: Ethics.” It makes a lot of sense, yes? Yep, there’s some hard and raw stuff in here, personal stuff that Diana shares about her own pains and struggles and wounded relationships and there are things in here that are utterly delightful. She is honest about the complexities of all this (our own woundedness and hardness of heart and our culture’s structures and dispositions to resist grace and gratitude.) But there’s really fun stuff, too – including a remarkable bit about play and creativity, even a bit about baseball. I was moved – again, almost to tears — in a chapter about the emotion of gratitude (in the “we” section) that showed how, when shared, can become the foundation for cultures of festivity. Joy and celebration are part of the ethos of some work cultures, some churches, some institutions, and, as she tells, even of certain neighborhoods and parts of cities. What fun! Like King’s famous “beloved community” we aren’t there yet. Which is why we need sustained study and encouragement and wisdom from guides who can help us ponder and embrace giving thanks and being generous, realizing their communal nature and public consequences. Can a book pushing back against modern misery be fun to read? Can a self help book be deeply spiritual? Can a book inviting an optimistic sort of good cheer, learned by nurturing gratitude be profound in a hurting, chaotic culture? Yes, yes, and, again, yes. This intelligent, nicely written book is all that and more. Grateful: The Transforming Power of Giving Thanks is worth buying, worth studying, and, at the end, worth being grateful for. 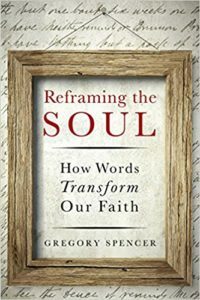 Reframing the Soul: How Words Transform Our Faith Gregory Spencer (Leafwood) $15.99 Oh my, what a handsome, nice paperback, a perfect book to read alongside Grateful by Diana Butler Bass. In fact, Spencer has a very, very good chapter on gratitude in Reframing the Soul and it helped me as I was reading Butler Bass. I’m not stretching it to say these two really could be read in tandem. For what it may be worth, I’ve known of Gregory Spencer for years. Although it has been out of print for more than a decade, we used to push his A Heart for Truth to any college student who would listen. (Now that honor goes to the Brazos Press book Learning for the Love of God by Opitz & Melleby, of course.) In more recent years, Spencer wrote a lovely book called Awakening the Quieter Virtues (IVP; $16.00) which looks at character attributes such as innocence and reverence, discernment and gratitude, modesty and authenticity. He wants us to grapple with thoughtful stuff, but is the sort of spiritual guide who walks readers into very, very real-world, stuff. It is a book about spiritual formation but very practical. I wasn’t sure, I’ll admit, what Reframing the Soul would be like, but I knew I liked and trusted Spencer as a solid, helpful thinker and a good, clear writer. When we first heard of it we liked the subtitle “how words transform our faith.” I was maybe thinking it might be about books or literature. When it arrived I scanned it quickly, and was struck by its layout and design and the very good poem that concludes every chapter. I looked through the discussion questions and realized it really was a self-help kind of book, about coming to terms with how we think about our life, based on the words and stories we tell ourselves. Ah, yes…. now that I’ve read it I can say that it is, indeed, a book about basic spiritual growth with this nearly psychological foundation. Spencer sounds like a counselor but actually taught communications studies at Westmont (yes, the irony is thick, here, as Diana Butler Bass used to teach there and she writes about it in her book.) As a communications guy, Spencer is a great writer – he makes his points, tells stories, draws on great quotes from both old classics and contemporary writers, Christian and otherwise. He’s a born storyteller and some of his illustrations are just captivating. But besides communications – and this book is rooted in pretty serious study and awareness of how linguistics and story works – I gather that Mr. Spencer is a fine counselor, a mentor, a caring guide, maybe even a pastoral voice for many of his students and associates. He’s no saint – he makes that pretty clear, too, in his honest stories about his own foibles and mishaps – but he has this knack for pushing people to ask deeper questions about what is really going on under the surface of one’s life, fostering great self-awareness. (Remember, he wrote that book about the “quieter virtues” which includes discernment and authentic, rejecting hubris, being aware; he has this kind and gracious way – according to the stories he tells to illustrate his points – of probing and inviting and helping folks see things afresh.) This is a great gift and I don’t know of any book quite like this. Seeing things afresh is what this book is about. He is convinced that we basically tell ourselves the same story, the same way, over and over, and it becomes true for us, impacting how we see not only the incident or persons involved, but how it shapes and forms our own behaviors. This is commonly known – think of the TV shows or movies where a person is told over and over she is dumb or ugly or lazy or won’t amount to anything and the hero or heroine has to overcome great obstacles just to prove to their parents or nemesis that they are somebody, they do have talents or capacities. That we are wounded, often for life, by lies people say about us, or lies we believe about ourselves, is nearly self evident. Alas, Reframing the Soul goes a bit deeper, even though the prose is simple and the stories are often hilarious or poignant. Spencer has written a book that I nearly want to call – for those few for whom this would be an asset – a worldview book. He shows how our lives are construed by the deepest ideas we hold and the social imaginaries that developl how we see and lean into life. He’s read and cites James K.A. Smith’s You Are What You Love so there’s no reductionism about mere, abstract intellectual ideas being the only things that shapes us; he is fluent in conversation about our deepest desires and the storied nature of our lives. So, yep, Spencer does all this is a really fine and thoughtful way, studying and exploring (and did I say, telling lots of stories!) the way words matter in our lives, the way the plot of our lives unfolds, the way our attitudes and practices – I’d say our very worldview – are dynamic and changing in part shaped by the words spoken to, about, or over us, Spencer gives us handles for re-thinking, re-construing, re-framing our lives. His framework (excuse the pun) of frameworks and re-framing, is, actually, a very, very helpful way to get at this who phenomenon. In our last BookNotes post I swiped a phrase from Jamie Smith about how we are often “conscripted into a story” or some trajectory towards what we’ve come to imagine as the good life. We are conscripted by stories and imaginative frameworks, worldviews and songs, Smith and Spencer both know this. But Spencer, especially – he’s a communications specialist, after all – realizes that much of this comes from the words we use to tell the particular stories of our lives. Why do we use this word to tell the story that way? What baggage, about shame or guilt or blame or failure or debt does that phrase bring with it? What if we told a story using other words? What if we reframed an incident with other language? That is what Reframing the Soul: How Word’s Transform Our Faith does for us. Then Spencer opens up the discussions about how new words can reframe and set us free from less than life-giving, less-than-adequate perceptions. Please note, this is not some technique like “neuro-linguistic programming” nor some name-it-and-claim it nonsense about positive confession. It is wise and nuanced council about reframing our stories based on how we choose to tell those stories, inspired, as we can be, by Biblical truths and spiritual discernment. Three features at the end are brilliant. One is about “finished and unfinished frames.” This chapter starts with a long and sordid tale from his own broken family. A final appendix is called “Reframing with the Saints” and draws on a variety of older saints to help us as we re-orient our own worldviews and life narratives. The final part is a long and excellent study guide and discussion resource that would make this an ideal study for a group. Reality, a friend of mine once said, is what you run into when you’re wrong. Reframing the Soul is a wonderful guide to navigating reality with grace and truth. It is honest, hopeful, literate, and faith-filled. His framework for daily life is brilliant! And so, we love A.J. We appreciate his great writing, how he draws on so many great sources – in this book, from Eugene Peterson to Flannery O’Connor, from Marva Dawn to Kenneth Bailey, from Nancy Sleeth to Barbara Brown Taylor, from Charles Dickens to Wendell Berry, from poets to prophets, scientists, and more. There are so many good books on the Sabbath and Sabbath keeping that we stock and love. (I do think Marva Dawn’s Keeping the Sabbath Wholly remains a must-read and most everyone who reads in this topic knows that the dense old Rabbi Abraham Heschel’s Sabbath is a true classic. I’m very fond of the upbeat and readable The Rest of God: Restoring Your Soul by Restoring Sabbath by Mark Buchannan and Swoboda himself draws on his mentors Matthew and Nancy Sleeth and Matthew’s 24/6: A Prescription for a Healthier, Happier Life (with a nice foreword by Eugene Peterson) not to mention the amazingly broad and visionary Living the Sabbath: Discovering the Rhythms of Rest and Delight by Norman Wirzba. Swoboda has that same sort of vision of “rest and delight” and writes with joy and vigor.) As you can see, there are a lot of good books on this, all worth spending time with – perhaps as a Sabbath practice. But why one more? I cannot say that I’ve enjoyed one as much as I have this one, nor have I learned as much. I’ve read seven or eight books on this topic, at least, and Subversive Sabbath: The Surprising Power of Rest… is among the best. It’s a big, thoughtful, wonderful book and I really, really, want to commend it to you. If I were permitted to recommend only one book on Sabbath-keeping, Subversive Sabbath would be it. No one can read this book and ever again associate Sabbath-keeping with ‘blue laws’ or legalism or boredom. Subversive Sabbath dares one to do life as God intended from the beginning. Well, what can I say after those stellar endorsements? These are all from people I really like, folks I trust as thinkers and as writers, so wanted to share them with you. 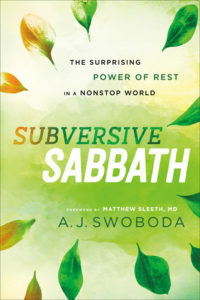 Subversive Sabbath: The Surprising Power of Rest in a Nonstop World, in a way, is also a very good book to read with or after Diana Butler Bass’s Grateful: The Transforming Power of Giving Thanks. I hope you can see that these explore somewhat similar territory, even if Swoboda is a Bible teacher and pastor while Diana is sociologist and researcher; her topic is more directly psychological and could be read by nearly anyone – the emotions and ethics of gratitude are pretty universal – while his seems more directly written for those who are on the way of Jesus and seeking a faithful sort of discipleship. That is, one of the aspects of a Sabbath-keeping life and of the grateful life is a core trust in the abundance, grace, and trustworthiness of God and the sturdiness of God’s creation. 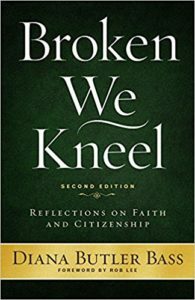 That both Butler Bass and Swoboda draw upon the generative insights from Walter Brueggemann is no surprise. That they both invite us to a grounded, sense-of-place with interior lives that bear fruit for the common good is, again, no surprise. These things over-lap and relate nicely. Swoboda’s book is arranged in four parts: Sabbath for Us, Sabbath for Others, Sabbath for Creation and Sabbath for Worship. There are three good (and well footnoted) chapters under each section, making this a 12-chapter work. I could go on and on about passages I enjoyed and insights I gleaned and stuff I pondered (and a number of things that pushed me to maybe repent of some of my own drivenness and disobedience to these things) but I think I will just mention a few final notes. It will give you a good overview of how much is covered and why this is an important book for you even if you’ve already studied another good book on this topic. In the “Sabbath for Us” section he has a long section about time; in these 24/7 (or, now is it 25/8 as we try to extend the very limits of creation?) this is crucial stuff. I got hooked thinking about all this from the luminous, stunning pages of the gentle Receiving the Day: Christian Practices for Opening the Gift of Time by Dorothy C. Bass (Jossey Bass; $14.95) and of course Swoboda cites it. There is a good chapter on work – it is especially good for those of us who don’t work with our hands, much, or are stuck in offices and what some call “knowledge work.” There is a very important chapter on health. We should all take in the “Sabbath for Creation” section since, well, we all live on land, and eat, and are involved, in on way or another, with animals. This is not just for environmental activists (although, given the cut-backs in environmental regulations and the current administrations compromised role in this field, we all need to step up our stewardship game these days!) There’s a chapter on the creation, one on the land, and one, as I mentioned, on critters. The final three chapters are under the rubric of worship – although that is fairly loosely used. These are rich and potent chapter on “Sabbath and Witness” “Sabbath and Worship” and “Sabbath and Discipleship.” Oh my, this is transformational stuff, really, really good. We can rejoice and thank Brazos for doing this book and for having great reflection questions at the end of each chapter. It’s a gloriously written and very, very informative title, and may be just a bit much for some small groups. (It’s over 200 pages.) But the 12-chapter format isn’t toooo long, I don’t think, and it is stimulating and will lead to spirited conversations, for sure. So, there you go, friends: a book on gratitude, a book on reframing our stories by using better words, and a book about the many aspects of a Sabbath way of life. All three are delightful subversive, each in their own ways. Buy some books, but hold on to your hats.